You may have recently seen posts on social media warning about the dangers of screen time for young people. While I don’t want to take the time to deconstruct all of their arguments, I do get it! There are concerns about how much screen time is too much screen time. Most people would probably tend to agree with me that common sense should play a huge part in this debate. I don’t think a device is a good babysitter for an infant. I think moderation for most things is a good thing. The problem with this debate is that there is a lot of fear-mongering that takes place and not a lot of research to back up those beliefs. We are at a time in history where devices, like it or not, are an integral part of the world and we as teachers need to recognize the importance of this fact. As teachers, one action we can take to counter the critics is to provide rich activities with the devices that we are having students use. We need the WOW-Factor! Convincing a critic is not easy when devices are being used as mere substitutions for what has always been done. Let’s face it…a digital worksheet is still a worksheet. Why waste screen time on that type of activity? What is needed is for students to be creators of content. This is where the WOW-Factor comes into play. Allowing students to use devices to make decisions on how they will show their learning will go a long way in showing those critics that devices do have value. This decision-making process should be an important part of the experience of school for students. The key…we have to regularly give students these types of opportunities. Will it make the classroom look and function differently? Will the role of the teacher change? Absolutely, but that is what we owe to students who are attending schools in 2018! There are so many ways to allow students to create that it would take many blog posts to cover them. Starting to use apps/services like Buncee, iMovie, Explain Everything, Book Creator, SeeSaw, etc. is a great starting point. These apps/services allow students to start with a blank canvas and create. This blank canvas is about them showing you and the world what they know and how devices can be used in an effective way. Here are a couple of examples that teachers in my district have shared with me that show the real power of devices in the hands of students. 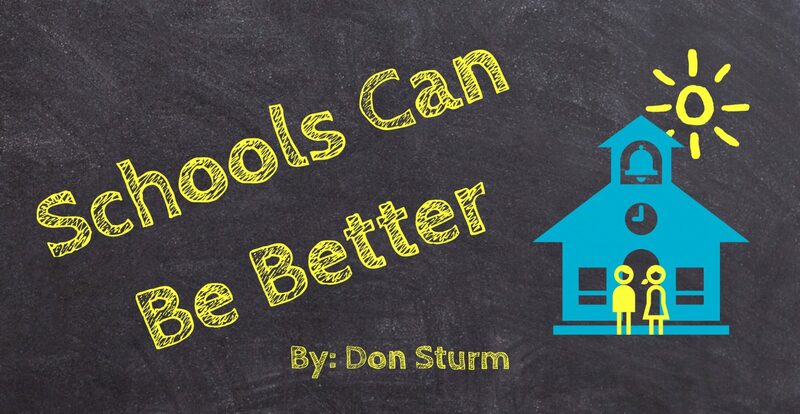 When the technology nay-sayers see a Wow-Factor product created by a student, you have provided the hook to start a different discussion about the benefit of devices in the classroom. It is all about perspective! I was helping a new instructional coach come up with ideas for a video she is making describing her new role. She mentioned that when she described the role of an instructional coach to a classroom one student mentioned that she must know everything. Her response was something along the lines that she didn’t know everything, but she could see the classroom from a different perspective because she wasn’t the classroom teacher. This exchange really got me thinking about the importance of perspective in education. Vocabulary.com defines perspective as, “the appearance of things relative to one another as determined by their distance from the viewer.” There are many examples of how we try to gain perspective. Players on a football team can only see the field through their helmet. Even the best players can only see so much of the field at one time. Teams counter this lack of perspective by placing coaches in elevated perches to gain a view of the whole playing field. This new perspective helps coaches make decisions based on the big picture. NASCAR teams employ spotters who sit on top of the viewing stands to help drivers “see” more than they can while in the car. Urban planners use aerial perspectives to make long term decisions about how cities should expand. From their perspective, the Thai soccer team trapped in a cave only had one way out and it was blocked. It took others outside of the cave to see the big picture and make decisions that lead to the happy ending of that story. So what does all of this have to do with education? As educators, I think we need to ask one simple question, “How can I get a different perspective of my classroom?”. The answer could be asking an instructional coach to come in and provide that added point-of-view. It could be visiting classrooms to see how other teachers are working with students. Recording your lessons and reflecting could help you see your classroom in a different light. Social media can add a different perspective as well. Becoming active on Twitter helps you to gain perspective because you have contact with others and how they educate their students. You may not like or agree with some of what is shared, but the experience will force you to reflect on what you do in the classroom. In other words, you have gained a different perspective. The app Voxer has been a powerful force for me in gaining a different perspective of education. My #4OCFpln Voxer group challenges me everyday to look at the field of education with different lenses. I believe my social media presence helps me to do my job better because I am exposed to a variety of perspectives ranging from different grade levels to different regions of the country and other parts of the world. Simply put, today’s teachers have to gain perspective to be the best educators possible. Gone are the days of doing things the way that you think is right without considering other viewpoints and strategies. What will you do to gain perspective? It’s All Over but the Connections! So I am sitting here in Chicago’s Union Station waiting for the train to take me home from ISTE 2018. All I want to do is sleep, but I thought I would start the reflection process. Let me start by saying…WOW! As a first timer, ISTE was very overwhelming. Being someone who likes being in social situations and unfamiliar places, it is good for me to feel overwhelmed. It helps me to see how others view the world. I see why introverted personality types feel exhausted after being in social situations. I have to admit that I was a little concerned after getting to McCormick Place on Saturday. There didn’t seem to be much open and things were crowded. Sunday wasn’t much better. The lines for sessions were over the top! People getting in line an hour and a half early for a one-hour session were common. There wasn’t much in the way of food. Complaining was common amongst participants. Sound like a negative experience? Not at all! Prior to the conference, I got a lot of advice that connections at ISTE were the best part of the conference experience. That advice was SPOT on…my connections made ISTE amazing! Being able to see and talk with educators that I hadn’t met face to face was amazing. Hanging out with Dan Kreiness, Louis Soper, Sarah Fromholder, Jennifer Ledford, Christie Cate, Amy Storer, and SO many others was simply awesome. Those connections that we had forged over Voxer and Twitter transferred to the real world quite nicely. Many educators with whom I work say that they don’t like social media because of all the negativity or the time that it takes to make connections. ISTE made me further convinced that social media can be a positive, life-changing experience and it is well worth the time that I have put into it. One other aspect that I was excited about was the opportunity to meet those educator “rock stars” who have written the books and blog posts that I spend much of my free time reading. Again, what a great experience. Every rock star that I met was a real, down to earth person who cares about education as a profession as much as I do. I have been BookSnapping since the beginning but had never met Tara Martin face to face. I don’t read the same since I started BookSnapping…my mind is awhirl with images and emojis! She was just as awesome and personable as she has been to me over social media. The energetic, thoughtful Jennifer Casa-Todd who has spoken my language in terms of the value of social media for students recognized me and gave me a big hug just like a regular person! What can I say about Dr. Sarah Thomas? Edumatch was my first experience on Voxer and my education life hasn’t been the same since. I had “met” her over a couple of Google Hangouts, but I got to meet her for real at the EduMatch Meetup. Such a great person. Sarah your passion for education and educators is much appreciated by many…I hope you realize the impact you have had on so many of us. I do plan on attending other ISTE conferences, but what hit home about this one is the power of being a connected educator. My goal will continue to be to get my teachers involved in social media in some way. It is truly the connections that matter! As a first timer, OVERWHELMED is the word going through my head right now. I have been to many conferences, but ISTE is by far the biggest. There is just so much to do and not enough time or human energy to be able to do it all in the Saturday to Wednesday time frame! I have read blog posts, followed hashtags, and joined the ISTE Voxer group all in the hopes of gaining some degree of comfort before stepping foot in Chicago next Saturday. The one thing I might have going for me is the fact that I have been to Chicago many times (I only live 2 1/2 hours away) so I don’t have the added stress of trying to figure out what I need to see outside of the conference. What I am most looking forward to at ISTE is simply furthering the connections that I have fostered through social media. For me this is exciting! Many of the people that I have grown to know over the last two years will be there as well. Unless you have a strong PLN it might be hard to imagine what this group of people has given me professionally. They have been a sounding board, they have challenged my thinking, they have pushed back on ideas, but most of all, they have been there anytime that I have needed them. While social media has come under fire for its negative influence on society, my experiences have been the complete opposite! I have one week left to put the “finishing” touches on my game plan to try to make the most of my time in Chicago. You can bet that I will be sharing photos (I’ll have my flat PLN ready to go) and Tweets about the experience. I should also give a shout out to my roommate for the week Dan Kreiness. I can’t wait to talk with you all in person.